Package A One Entrée Buffet served with two side dishes, salad service, bread service and a non alcoholic beverage. Package C Three Action Stations, with condiments, and a non alcoholic beverage. Package B Two Entrée Buffet served with four side dishes, salad service, bread service and a non alcoholic beverage. Package D Three Appetizer Stations and a non alcoholic beverage. FACILITY FEE COVERS All tables Chivari chairs White or champagne linen napkins Table linens Glassware, silverware and plate ware This includes the use of the building for the day to decorate, which if no event is scheduled the night before, you can come in to decorate the night before as well. We have a designated room available for the Bride to get ready in. Your actual event will last for 5 hours and will be held on the second floor in The Neches Room, The Ballroom and on The Porch. This space provides the ideal spot for a rehearsal dinner. This area, our only downstairs space, seats over one hundred people and has its own bar. It also portrays beautiful views of the golf course and the sunset through its floor-to-ceiling windows. This gorgeous room provides everything you need for your reception capable of seating over 200 guests still leaving plenty of space for your party to light up the dance floor. This space radiates sophistication and class overlooking the scenic Neches River. The Spindletop outlines the perfect alter with its rounded floor to ceiling window. It could also provide a pristine place to display your cake providing breathtaking pictures. Set nearest to the golf course, The Portico features breathtaking views from floor to ceiling windows that swathes you on three sides. This elegant porch opens up into The Ballroom making it the perfect pre-reception area for guests to enjoy handcrafted Hor d’oeuvres and specialty cocktails while awaiting the bride and groom. Capacity depends upon set-up requirements; typically The Portico seats up to ninety guests. 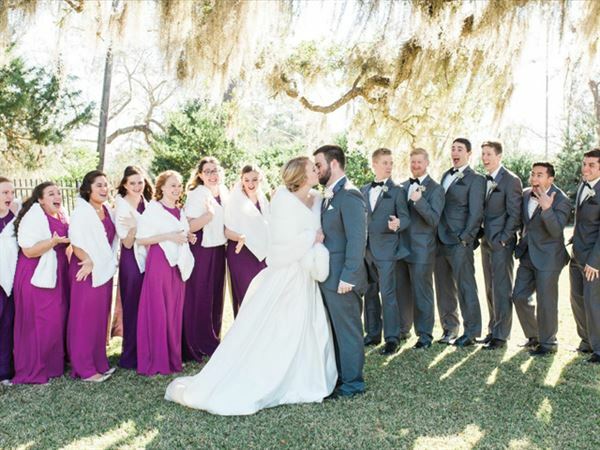 The Portico The Neches Room The Ballroom The Clubhouse The Terrace A combination of the individual facilities above can be customized to the needs of your special day. Facility rental fees vary depending on the day of the week, time of the event, and the number of facilities being used for the event. BCC members receive discounts when renting out facilities. The Portico, The Neches Room, and The Ballroom are located on the main floor of the club. These rooms can be utilized individually or opened up to create a massive floor space capable of accommodating four hundred and twenty-five guests. The Clubhouse is located on the lower floor and leads to The Terrace, which is the only facility located outdoors featuring a one of a kind atmosphere overlooking the Neches River providing relaxing shade beneath our one hundred year old Oak. I selected the Beaumont Country Club as the venue for my parent's 50th wedding anniversary. I worked with Tara Rodriguez to book the facility. Tara was absolutely fantastic! She sent me documents via Email with all of the event options the facility offered. We ended up changing options a few times. Tara was very patient with us and was quick to return quotes reflecting our requests. Our event started at 6PM, but Tara let us into the facility early that morning to start decorating. Everything we asked for was provided. The entire space (the Neches Room) was given to us and we were given everything we needed and asked for to make it our own for a night. It was really a beautiful space, with one whole wall being glass windows that overlooked the river. When the event started, Tara and her crew did all they could to make it go well. Naturally I was distracted by visiting with family, but Tara kept me on schedule with the dinner, toasting and cake cutting. The appetizers and buffet were excellent. I had several people make comments on how great the food was. The staff was endlessly polite and helpful, bringing drinks, turning down lights on request, cutting and passing out cake, etc. I received many compliments about how flawless the event was - and it was! But I can take no credit for that. It was all Tara and her team. I would recommend this venue to anyone wishing to host an event in the Beaumont area. The Beaumont Country Club was the perfect location for our high school prom. The students loved the huge dance floor, the food and the overall elegance of the entire establishment. Tara, our coordinator at the club, was the most helpful, friendly, organized and considerate person I've ever had the pleasure of working with for events. She went above and beyond to make it the best prom for our students. We will definitely be back!